If you're seeking a fast, effective solution for viewing and editing all sorts of DBF files, DBF Viewer 2000® is the answer. This feature-rich program can handle files from dBase, Visual dBase, Foxpro, Visual FoxPro and Clipper, to name just a few, with a performance that easily rivals costly professional database utilities. Its optimised proprietary engine means that no matter what your file size, DBF Viewer 2000 is incredibly fast, performing any task you set it - from a simple query and duplicate clean-up to data export - at lightning speed. With DBF Editor's simple, dynamically generated visual dialogues, you can easily see the structure of your DBF files and edit them exactly as you would with native database management tools. In addition to being able to view the contents and structure of DBF files, you can also view and edit dBase III, dBase IV, dBase Level 7, FoxPro and Visual FoxPro format memo fields. Command line automation is fully supported, making it simple to repeat activities including data import, replacement and export and clean-up of duplicate records. Because DBF Viewer 2000 is completely independent of database engines, drivers and database management systems, you can simply install the program and start viewing and editing DBF files immediately. DBF Viewer 2000® is very easy to use, with an extremely intuitive interface and a simple initial learning curve, saving you time and effort. Optimising DBF file structure is very straightforward with DBF Viewer 2000, enabling you to easily add, edit, reorder, delete and rename fields. 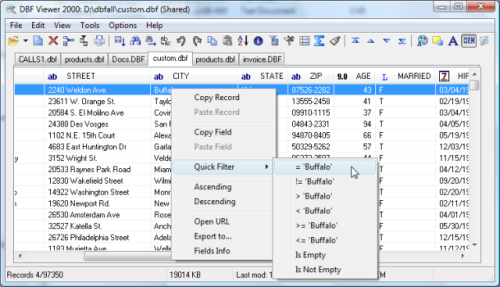 You can import data via the GUI or command line interface, and from a variety of formats, including CSV, TXT, Excel as well as DBF. Advanced DBF export to formats including CSV, HTML, SDF, SQL, TXT, XLS, XLSX, XML and to MS SQL, MySQL, Oracle and PostgreSQL scripts from GUI or command line. Keep your database clean of any duplicate records to avoid errors and confusion in reports. Duplicate removal is as easy as 1-2-3. Download DBF Viewer 2000 FREE! Registered users will receive all future versions and upgrades free, as well as virtually unlimited technical support. An activation code will be emailed to you immediately after registration. Updated: April 18, 2019 DBF Viewer 2000 v7.17 released!